Over the last eighteen months I have been on the move. My elder son has started at university in Scotland and my younger son is busy planning his gap year in the States. Having spent the last ten years on my own 'gap year', I have recently remarried and moved into a working vicarage. In the process I have acquired a whole new set of roles as well as a beautiful step daughter whose love trials have taken me back to my own eighteen year old self. In the midst of these shifting life plates I have experienced my own deep murmurings. I have turned 50. In the move I came across a photograph of my teenage self in one of those boxes that I hadn't opened in years. It was taken at my debutante party - my 'coming out' party - at the yacht club in Vero Beach on the east coast of Florida in the 1970s. I am sitting beside my grandfather. While I glance self-consciously to my right, maybe a little anxiously, my grandfather stares straight ahead, on top of his game, like a mafia boss contemplating a hit. It touches me. When I was turning from a girl into a young woman there were social conventions and peer group expectations. There were grown-ups to dodge my way around and also to help me negotiate my way through. There was the promise of adventure and there was lovely day-dreaming. There were parties. But now, standing on another threshold, I face an unknown future with few signposts. And the places to which I have always gone for inspiration - the films and magazines and fantasy characters that played such a key role in the creation of my younger self - have simply disappeared. They have dried up. I feel bereft. What does it mean to be newly married again at this age? What do I take with me and what do I need to let go? 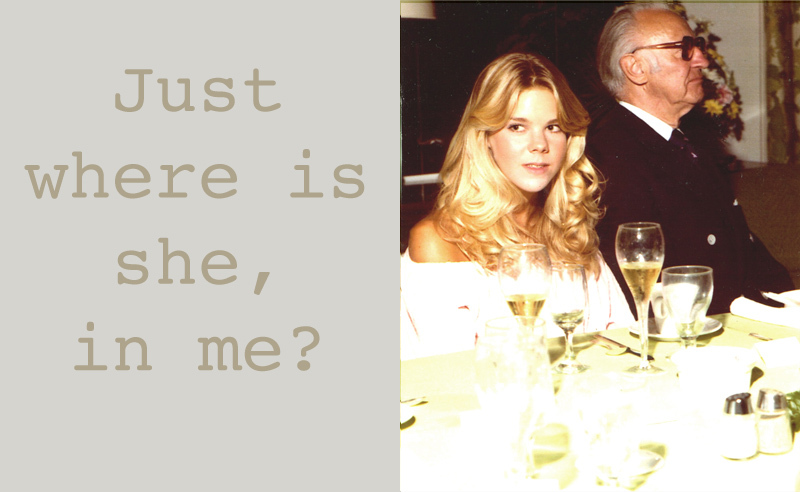 Who now are my role models and my muses? I am still a little anxious, looking over my shoulder for clues. Only now the girl in front of the mirror at 18 stands there at 50. Maybe less wilful, she is still wondering what lies ahead. I want to open up a new conversation with my younger self in order to reconnect with how I got to where I am today. To make sure that she comes along with me. I don't want to loose the spirit of the girl inspired by adventures of Huckelyberry Finn, or the teenager with her Singer sewing machine who spent hours making creations more inspired by Cosmo Cover girls than Simplicity patterns. Much to my parents' horror. In these get-ups I created at fifteen for my lanky hollyhocks body, just coming into flower, certainly nobody ever thought I would end up a vicar's wife. Least of all me. I've been playing all my life. But do I have to stop? 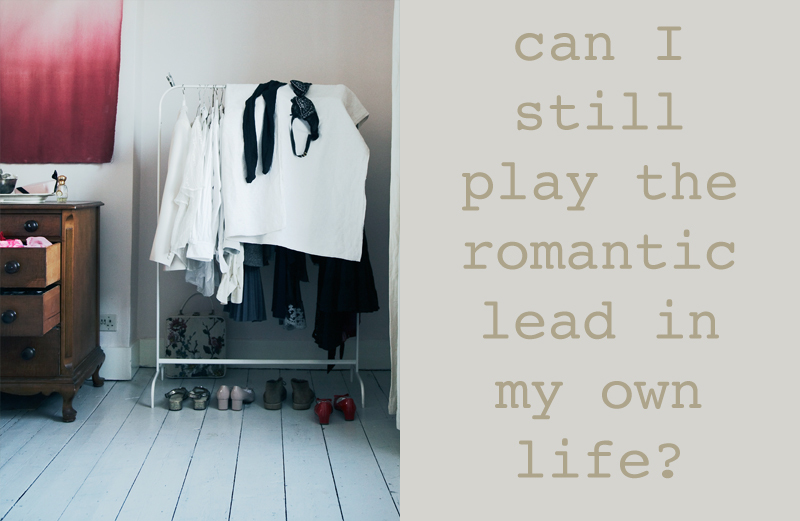 Can I still play the romantic lead in my own life? Where do I look for inspiration and guidance? Something tells me I am going to have to dig a bit deeper. I'm going to have to use my wits and my skills in a different way. I'm going to have to look in new and surprising places. As a designer, stylist and more recently a photographer I've spent my career trying to create beautiful things. Now I realise it's not about fashioning beauty but finding it. And finding it in the everyday things around me. When I look now at women in their 50s I see so much beauty. And I want to know their story. I was never a great reader - until recently - but I have always been a keen looker. I see whole stories in images. The placement of a hand, the curve of a back, the colour of a room: these are my clues to the narratives. So I'm going on a journey to learn about some of those stories and then recount them in this blog. I'm going in search of my peer group. As I did in my debutante year I am still looking to my gang to show me how to navigate towards the next horizon. Still my age and older, the women in my gang will now show me how to be 50 with style and grace. Thanks for post! Having just turned 50 myself i needed the inspiration. I was very inspired by your work and your story about “maturing “. I like the way you speak about turning 50. Saw a wonderful quote by Reba McEntyr ” In life you need 3 things: A wishbone, a backbone and a funny bone.” As I grow older I find my favorite people have healthy doses of all three. They dream, they do…and they laugh at themselves… They may well be the crucial ingrediants for aging beautifully. Thanks for your post. I already like your work, and then I click on your blog (so glad I did) and then read this post about you turning 50! Great me too at december the 16th!! Beautifully put. I’m sure so many people will enjoy accompanying you on this journey. I look forward to reading more. Grace, dignity, insight.. ageing is so great for the brain, imagination and creativity. And as Lacy said above – continuing to able to laugh at yourself. Ah, it’s a great ride! I too found that when I turned 50 I looked around and found few role models for living authentically in this stage of life. So happy you started this conversation- beautifully done! Looking forward to the next installment. Awesome post and I’m looking forward to more. There are not enought blogs out there for more mature women!! Kristin, This is so beautiful. My thoughts often turn to you now when I stand at some sort of crossroads. You are a beacon and role model. this is so nice, kristin. i want to look like you when i am 50. having just turned 30, i’m excited to see what the future holds, thanks to this great post. I loved the honesty and realness of these women, of hearing about their live’s journey so far, and that they are living it with style & grace. I would love to see more please! 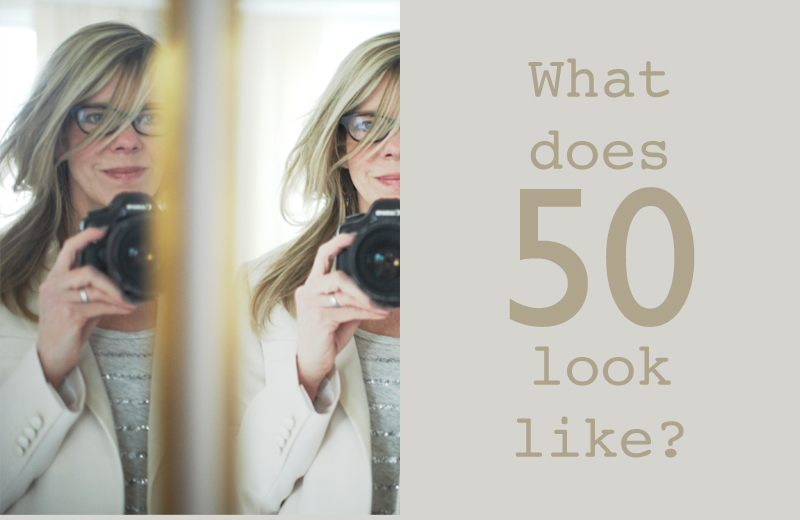 I’m not 50 (but 42) but I think your blog is a very good idea ! Bravo ! Thank you! I hope this blog will be inspiring for 40 somethings as well. We all need something to look forward to! So pleased I found this today. Going through a terrible time having just lost my beautiful sister to a sudden tragedy, she would have been 50 next week. She was an inspirational woman, a sister a wife, a daughter, a mother and a dear dear friend. It’s been so great to read about these women at 50 and how beautiful and inspirational we all can be. I am so happy I found your blog, for me a woman can be an inspiration at any age, and in the 50’s maybe you are on top! Please keep on writing – would love to read more. Delighted to read that your son has just started university in Scotland! Really hope he enjoys living up here. Kristen, this is an inspirational site and one of the most beautiful ones I have seen in a long, long time. Reading these women’s stories feels like a wanted breeze blowing through an open window and although I am male, and yet to reach 50 it really is such an intimate insight and can only help me on the journey I share with my beloved wife. Thank you. 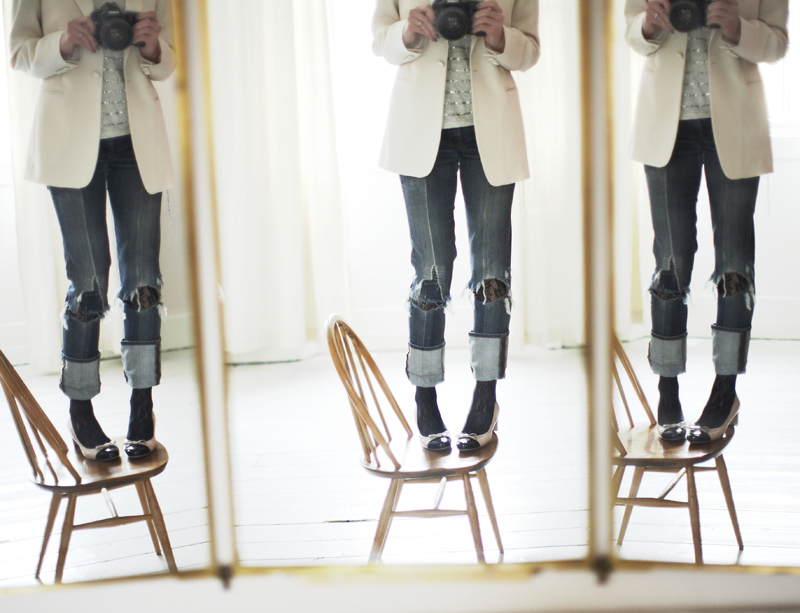 Not sure how I stumbled across your blog; such a lovely surprise. Beautiful sentiments and photography . You’ve created something very special here. Thank you. Ok all very nice but there are some practical things I thought you might address. 55 has been a bummer for me. Low libido and feeling frustrated that I cannot respond to my darling husband in the way I used to. Crook hip, pain, struggling to do the everyday things. Trying in all that to remain positive and today I am not. The real world has pain, problems and then a I will just get on with it attitude. You cry, you laugh you get on with it but some of it stays tough. Stumbled across your blog via Loop Knit Lounge. I love your work and am inspired by the stories and images. As a 65yo it made me look back over every decade with their ups and downs.